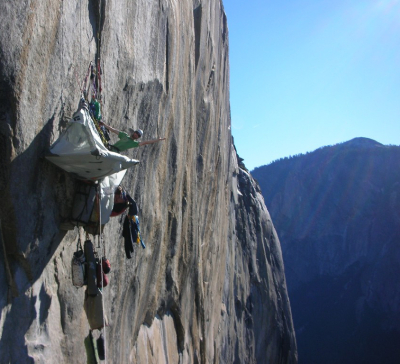 Hauling kit on a big wall is much easier than climbing with it in a backpack, especially for overnight walls. Before you leave the ground, you'll need to attach the haul rope and a docking tether to the haulbag. The docking tether attaches the haulbag to the belay so it can be released easily (more on this later). 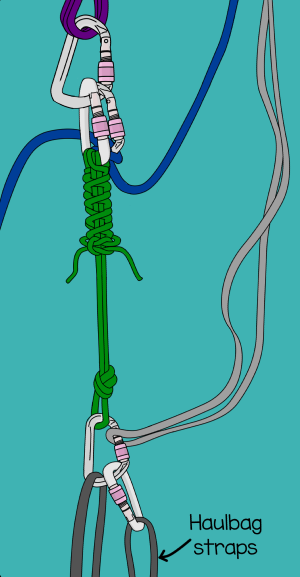 Tie a figure-8 or an alpine butterfly in the end of the haul rope and attach it to the main hauling carabiner with another screwgate. 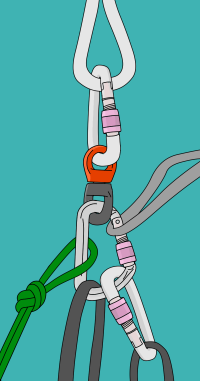 Clip one haulbag strap and the docking tether to the main hauling screwgate. When you fasten this screwgate, it'll remain closed for the duration of the climb. This screwgate will be constantly loaded until you reach the summit. On most haulbags, one strap is shorter than the other. Clip the long one into the main hauling carabiner. The other one can be clipped on to the main hauling carabiner either with another screwgate, or extended with a length of cord. 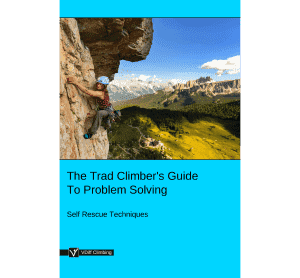 If your route is slabby with many traversing pitches, it is worth using a swivel on the haulbag to prevent kinks in the haul rope. Attach the other end of the haul rope to the haul loop on the back of your harness. If you don't have a haul loop, you can make one by tying a short piece of webbing around your waist belt. Don't clip it to a gear loop – they're not strong enough. 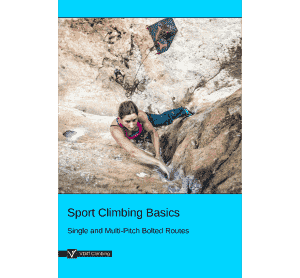 When you've led a pitch, you'll first anchor yourself to the belay, fix the lead rope for the follower and set up the hauling system (See here if you've forgotten how). After a final check of your hauling setup, you can tell your follower that the 'haul rope is ready'. 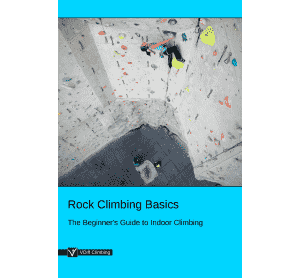 They can then release the haul bags on to the haul rope and leave the lower belay. Now the hard work begins. 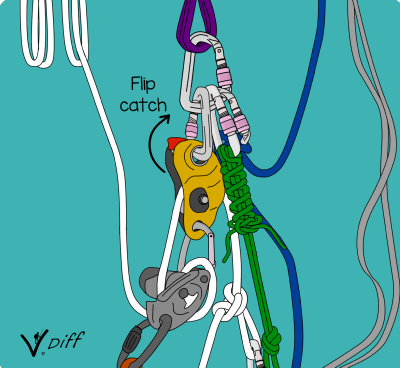 Lean your weight back onto your GriGri so it locks, and push out and down from the wall. The lighter your bags, the easier this will be. If your bags are super heavy, try bracing your feet against the wall above your head and pushing out using your legs. 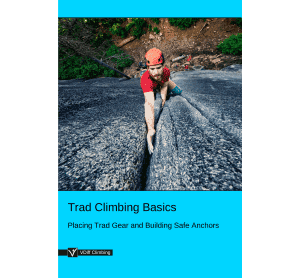 Once you have pulled some rope through the hauling device, step into your aiders and 'reset' by pulling the slack rope through your GriGri, as if you are taking in a top rope. Remember to stack the rope away as you haul. 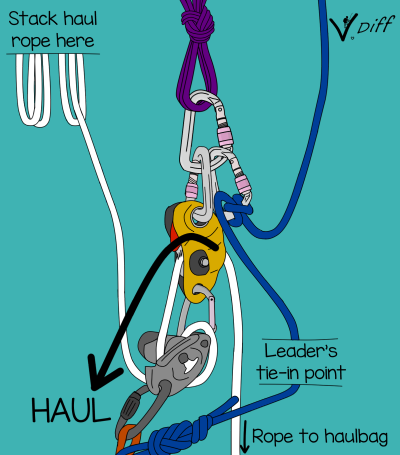 Repeat this many times until the haulbags finally arrive at the belay. Stop hauling when the knot to the haulbag is around one foot away from the hauling device. Do not haul the knot into it! 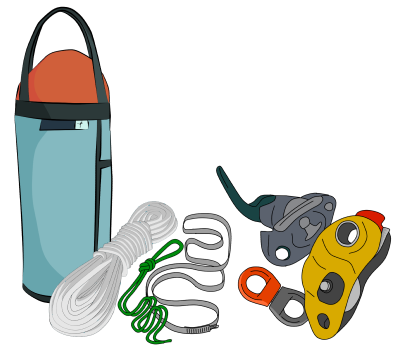 Now that the haulbag is at the belay, you'll need to 'dock' it. 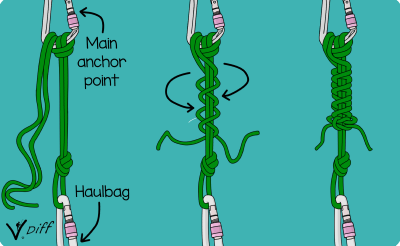 Attach a screwgate to the main anchor point and fasten your docking tether to it with an Italian hitch (make sure not to tie the similar-looking clove hitch). Pull this tight. Wrap the loose strands neatly around the docking tether beneath the Italian hitch and finish off with a reef knot. The friction of these wraps stops the rope sliding through the Italian hitch. Attach your back-up sling to a bolt, making sure there's enough slack in the sling so that the haulbag's weight goes onto the docking tether, not the sling. Next, haul a few centimetres of rope through the hauling device whilst flipping up the catch. This releases the auto-lock on the pulley. 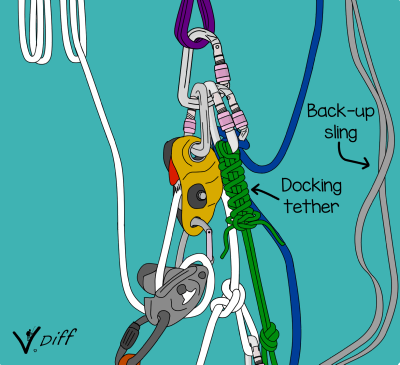 Lower the haulbag using your GriGri until it is weighted on its docking tether. If your haulbag is super heavy, brace yourself so you don't get sucked in to the pulley. Check that your docking tether is fastened tight and the back-up sling is attached. Then remove the hauling pulley and GriGri. 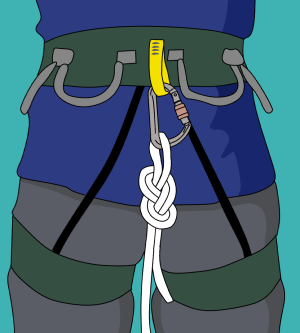 Remember that your tie-in point is quite long, so you may want to adjust it shorter if you are belaying the next pitch.